The all-new Tahoe features a lighter suspension, to help improve fuel economy. Yet, it’s also stiffer to maintain the excellent ride, handling and capability that Tahoe is known for. The result: Front springs that are 25% stiffer than the previous generation, aluminum control arms that are lighter and stiffer, plus a coil-over-shock suspension that is precisely tuned for superior ride and handling. With lighter weight components, you won't have to sacrifice capability. Tahoe offers a maximum towing capacity of up to 8,500 lbs. — plenty of power to tow boats, ATVs and whatever else you want to bring along. Variable Valve Timing helps ensure Tahoe performs at optimum power and efficiency. It continuously adjusts valve timing to keep the EcoTec3 engine operating near peak output, while minimizing emissions. At cruising speeds when full engine power isn’t needed, Active Fuel Management™ deactivates cylinders, effectively turning the EcoTec3 V8 engine into a 4-cylinder. When it senses the need for full power, AFM instantly reengages all cylinders. Tahoe LTZ is outfitted with your choice of standard 20-inch polished-aluminum wheels (available on LT), available 20-inch chrome-aluminum wheels or available 22-inch aluminum wheels† with premium paint and chrome inserts that make a seriously stylish impact. 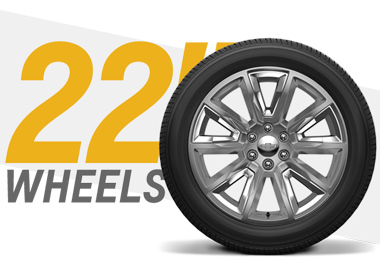 LS and LT models feature standard 18-inch bright machined-aluminum wheels. Details include a distinct available lighting package with standard projector-beam headlamps and rear LED taillamps, plus a hidden rear wiper system tucked under the rear spoiler at the roofline. 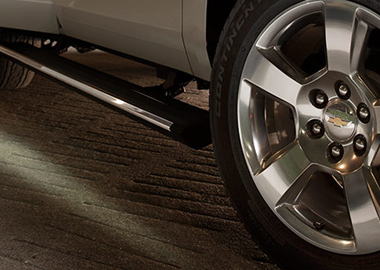 Tahoe also offers available power-retractable side assist steps with perimeter lighting, which help passengers exit more safely. And the handsfree programmable power liftgate ensures that you'll worry less about the liftgate hitting a garage door or being out of reach. A sensor under the rear bumper allows you to open the liftgate with a gentle kicking motion— which comes in handy when your arms are full of groceries. Tahoe LTZ models offer standard heated and cooled perforated leather-appointed front bucket seats. You'll enjoy the convenience of available power-release second-row and fold-flat third-row seats — the fastest power-release second-row and power-folding third-row seats of any competitor — and the versatility of a flat load floor to store cargo. With the second- and third-row seats folded flat, the all-new Tahoe offers 94.7 cu. ft. of cargo space. Creating a quiet cabin environment was a major focus for our engineers when they designed this full-size SUV. Their noise-reduction efforts extended to other areas, including isolating noise in the engine compartment and using acoustic wheel liners to absorb road and stone-throw noise. The next-generation available Chevrolet MyLink lets you customize the system to your needs and sync up to 10 devices via Bluetooth. Stay connected with your hands safely on the steering wheel using Bluetooth® wireless technology. Simply pair your compatible Bluetooth-enabled smartphone with Chevrolet MyLink or connect through one of the six available USB ports, and you can have access to your entire contact list, personal playlists and select mobile apps. Bring your technology with you and stay completely connected wherever you’re headed, whenever you’re on the road. With up to 13 charging locations, including up to six USB ports and Wireless Charging to connect phones, plus a 110-volt three-prong plug to charge your laptop and other devices, you'll always stay connected in your Tahoe. Your devices can always stay charged thanks to Wireless Charging which eliminates the need for cords. 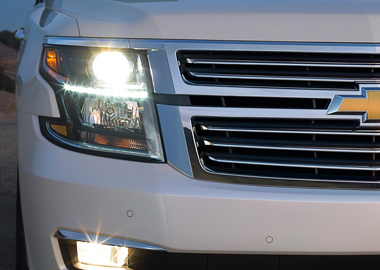 The all-new 2015 Tahoe features a host of available driver assistance technologies. Front Park Assist helps when maneuvering Tahoe in tight parking situations. Side Blind Zone Alert with Lane Change Alert use radar sensors in the rear quarter panels to detect fast approaching vehicles from up to 230 feet away in the adjacent lane or blind zone and warn drivers of their presence. Cameras and radar sensors surround the vehicle and operate together to help ensure drivers are aware of the road — and their surroundings. Tahoe features a standard front center air bag (with standard front bucket seats), designed to activate between the driver and front passenger to offer added protection in side-impact collisions. A 360-degree sensor system to ensure optimal air bag deployment comes standard and includes sensors on every door, a rollover sensor, and front and rear impact monitors. A strong frame is key to helping keep people safer. You can drive with confidence knowing that the all-new Tahoe has a reinforced safety cage with strategically placed crush zones to help maintain the integrity of the passenger compartment in the event of a collision. High-strength steel in the A- and B-pillars and roof rails and added roof reinforcements help improve safety in potential rollover collisions.